My name is NOLUNA, I am always in trouble. I am as cute as can be, and loved beyond measure. I have 5 siblings, and a sister dog, but I can't help myself, because I get into everything. I just recently ate the spaghetti sauce and meatballs. I didn't think anyone would notice. I guess the red sauce all over my nose gave it all away. I also ate Mama's couch, and I did jump the 5 foot fence. I love snow, which I just discovered. Wow, I am a husky. 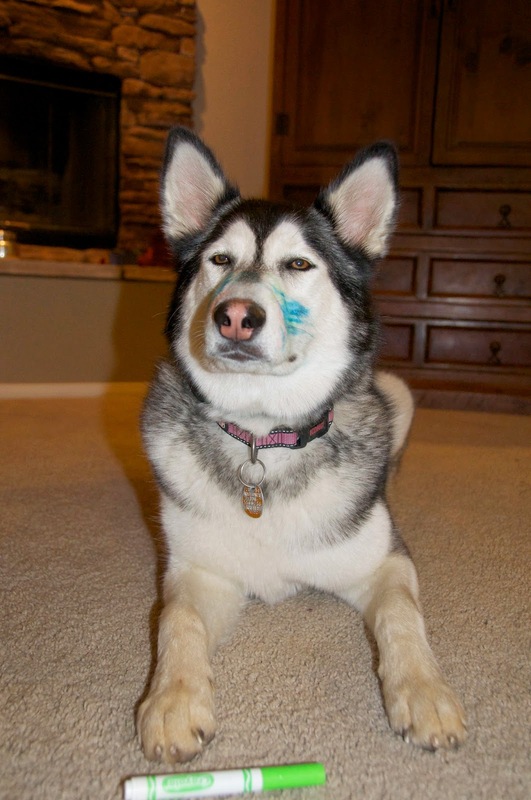 Today I found my little sister's backpack and I ate the markers. I can't believe that the family noticed. I really don't know how they figured it out. I am really sneaky. I think I am busted, but don't tell anyone.